Big Vern ‘N’ the Shootahs is a nine-piece Soul Funk band delivering a unique brand of R & B & Soul with a big dose of suits, shades and attitude. This band generates a high energy show from start to finish. 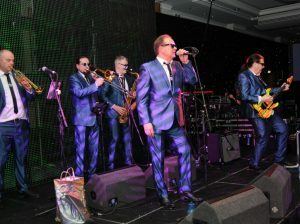 Over many years the band has appeared as special guests on tour with some of the biggest acts on the Soul/R & B circuit including the Commitments Eddie Floyd the Original Blues Brothers including Steve Cropper and Donald “Duck” Dunn who have written some of the greatest soul tracks ever for such artists as Otis Redding and Wilson Pickett. They were once voted third best act to appear in Glasgow by the Herald & Times. 1st was Michael Jackson 2nd Prince. 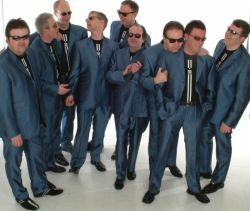 Big Vern n the Shootahs (BVATS) have been together since 1989 and are still enjoying entertaining audiences, be it at huge events like the World Cup celebrations at Glasgow Green, internationally attended functions in London, expatriate events in the Far East or small intimate gatherings for special memories. They take pride on bringing all the fun of the Big Vern ‘circus’ 100% to town, be it at our own advertised shows, corporate functions, weddings, car launches, open-air festivals, local and national radio and TV events, or many other bespoke events which we have enjoyed being a part of all over the UK.